www.oneninesixnine.com: So you are thinking of visiting? OK, so many people have asked about a visit to Zakynthos (or sometimes called Zante) that I thought it would probably be a good idea to put the details on here. Visiting can be done either on the cheap (package holidays start from around £140 although some travel agents offered specials from only £89 including flight and accommodation last year) or by booking into a luxury stone villa. But, first things first, Flights: Many Airports service Zakynthos including Bristol, Cardiff, London (Gatwick, Stansted and Luton), Birmingham, East Midlands, Leeds, Manchester, Newcastle, Glasgow and Edinburgh. I feel sure they may be more. You can book "flight only" at various places including, MyTravel, Thomas Cook, Cosmos Holidays or Monarch Airlines (Charter Flights section). That said, depending on the time of year, you often find it is actually cheaper to book a complete package, even if you plan to book a villa separately. Have a look at both options. You will find most flight times are very user friendly as we do not allow take off or landings between the hours of 10pm and 6am due to the Caretta Caretta mating season (see more below). Villas and accommodation: There are many options but one place I would certainly recommend are The Castello Bellos Villas. Don't pay too much attention to the prices on the web site which I think in peak season are in the region of 200 euros a night. I have negotiated a special deal with them and depending upon the time of year, prices are as little as 400 euro for the week. Take a look at the site, the villas really are stunning. They are about 15 minutes away from where I live and about a minute from the sea. Another option, which is further away and in land, but very nice are the Aresti Villas. I believe they have their own pools and great views. 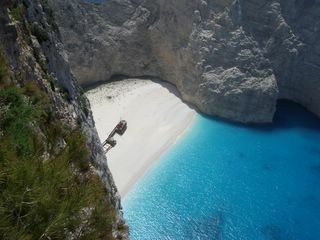 Slightly more "touristy" is the Louis Zante complex, about 5 minutes away from us and perfect spot for a great beaches. It is very close to Laganas, the liveliest place on the island although it is still quite family orientated. In all seriousness, Laganas can get very noisy in the evening so bear that in mind. Argassi, Alikes, Alikanas and Tsilivi are about 25 minutes away. If you are unsure on anything just ask me and i will do my best to help. Whilst you are here there are plenty of options for renting cars, you may get a better deal doing it through me but if you want to have a look online, most of the major rental companies are here. I purchased a car from Budget so I trust the guys there. Avis, Hertz and Europcar are all at the airport, if you use these, book in advance, you get a better deal and often full insurance for the price of third party. I have used Hertz a few times and had no problems. The beaches are very family friendly as the seas are calm and in some instances you can go almost 30 metres out and still not even be up to your waist. Almost all are very sandy. Apart from hospitality, Zakynthos is also famous for the Caretta Caretta (Giant loggerhead turtles). From July to September you will almost be guaranteed a sighting of them and it is very easy to swim out a short distance and swim with them. Underwater goggles and snorkel are certainly a must. They are about the size of a dustbin lid. Anyway, I think there is plenty here to be going on with, if you have any questions, just let me know and I will help where I can. I hope to see you in the summer!